The first World Squash Championships held in England for over twenty years were an opportunity for the sport to showcase its finest talent and provide a spectacle that would indisputably warrant Olympic inclusion. The National Squash Centre is a great purpose-built venue, and - being out-of-town - usually attracts what might be described as the 'squash community'. Unlike the adjacent Manchester City football stadium (any Premiership game is potentially a big draw) and the cycling velodrome (after the successes of Chris Hoy et al in Beijing), the status of squash is not (yet!) such that many first-time punters are likely to make the trip out to Sportscity to see squash for the first time. So it's a real challenge for the sport to attract newcomers to come and watch professional events. Would the promise of the sport's top tournament be a big enough draw? I'm happy to report that I did speak to one or two who were watching pro squash for the first time (all were impressed), even if the taxi driver who dropped me off outside was oblivious to the event happening in his own city (more on promotion and media coverage later). The Manchester crowd know their squash, and every game I saw was at near-capacity. It would have been nice to see the crowd getting a bit more involved, but maybe the size of the prize at stake mitigated against spectators getting too over-excited. Still, given that the players were competing for the biggest prize in the game, I wish the audience would not be so reticent in showing their emotions! The National Squash Centre doesn't have the natural sense of drama engendered by a glamour venue such as Canary Wharf, for example, and given the cavernous dimensions of the place would perhaps take double the spectators to really generate a cauldron. That said, there was a definitely greater sense of anticipation than at other events held here - especially when the home favourite Vicky Botwright was on court - that was worthy of a World Championships. The squash itself was of the highest quality. I almost feel that this is a redundant sentence nowadays, such is the level of competition at the top of the men's and women's games. I once read an argument put forward in a newspaper article around 10 years ago about what was considered the 'golden era' of snooker. Many feel that the glory days for that sport were in the 1970s and 1980s, when snooker enjoyed a much higher profile. The same parallel could be drawn with squash. Yet the counter argument that was put forward in the article suggested that - on the contrary - the present era (this was the late 1990s, early 2000s remember) was the greatest, even though media and public profile was lower: the standard of players had never been higher, there had never been a greater number of players competing for the top prizes, and the outcomes of tournaments (unlike earlier years) could not easily be predicted. It could be claimed that snooker is still in that 'greatest era'. The same could be claimed about squash today. There have never been so many top players who compete consistently at such a high standard (especially in the men's game), and the winner of tournaments is never a foregone conclusion. The irony for the sport is that, in a crucial year for raising its profile in the run up to the vote on Olympic vote, the oblivious majority of the public are missing out on a sport in its purest, most professional and competitive form. This was a World Open of upsets - in both the men's and women's draws - and this served up two finals that few would have predicted at the start of the tournament. The success of Botwright in what was her last professional appearance gave the home crowd someone to root for right until the end, even though the fairytale ending to her career was not to be. Many predicated that Ramy Ashour would have won his first World crown at such a young age, but the outcome of the men's final was by no means certain right until the end. In a rare visit to the UK he (and, to be fair, Darwish) gave the crowd a demonstration of 'Egyptian squash' that was full of flair and guile. The attitude of the players was mostly excellent, with the matches that I saw containing very few contested points. The scoring changes and more attacking games that those changes seem to have been a catalyst for appear to have played a large part in this positive move. 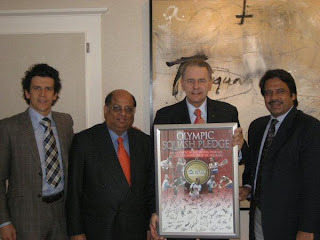 This was especially important given the attendance during the week of Sir Craig Reedie, a serving representative on the International Olympic Committee. The sport was under scrutiny during the week as it had to underline its credentials for inclusion in the 2016 Olympic Games, with a vote on this being taken next year. A criticism levelled at squash in the past was that there were too many stoppages and that the players liked to argue with the officials too much. Whether scoring changes, attitude of the players or better officiating resulted in there being fewer disruptions, the event as a spectacle game across as a great advert for the game, and hopefully went someway to dispelling some of the myths about watching live squash. Sir Craig gave a media briefing toward the end of the week that I missed, but I hope he was suitably impressed. Local media coverage and promotion of the Championships appeared to be strong, and it was great to see banners hung around Manchester city centre marketing the event. What was disappointing was - again - the lack of coverage that the event attracted in the national press. Some of the broadsheets failed to even carry an article - even after the Finals - and results were relegated to the sports results listings. Well done to the Telegraph though, who had regular reports throughout the week online, its rejuvenated squash coverage arriving just before the biggest event of the year. Online coverage was patchy due to some of the journalists from the more popular squash websites being either unavailable or unwilling to cover the tournament. Squashblog, although only there for the semis and finals, enjoyed its highest visitor numbers to date, with most visitors (many from overseas) looking specifically for updates on what was happening in Manchester - so a squash media-hungry audience is out there! The role of the 'squash media' (specifically internet coverage) in the development of the sport was one of a number of things that was getting political 'behind the scenes' during the week: the move to universal PAR scoring and the Olympic vote being the other big themes. From an objective point of view, I'm happy to report that none of these things appeared to effect the running of the tournament, and the paying public was treated to a professionally-run, unpredictable and exciting week. If I was to identify the one thing that has to be improved if the Worlds are to be held in the UK again I would suggest a change of venue. The National Squash Centre is a great facility for the players and probably the administrators, but holding the event in the middle of a large city would have attracted a greater buzz, afforded better facilities for the spectator, and crucially made the event more visible. If you can't attract newcomers to come and watch squash then take it to them. On the train back I wondered how things would have been different if the event (or maybe the latter stages of it) have been held in Exchange Square in Manchester, or maybe at Salford Quays. The portability of squash is often overlooked as one of its great selling points as a spectator sport, and promoters shouldn't shy from experimenting with this features in order to attract new audiences - even when staging the biggest tournament in the calendar. A draw for a men's tournament that doesn't feature the name John White will be all the poorer for it. The 35 year-old announced his retirement after losing to James Willstrop in the recent World Open. When I first started to watch professional squash in 2002, John White was securely berthed in the top five in the world and was starting the ascendancy that would take him to the number one spot in March 2004 (a position he held for a couple of months). It was evident that he was a tough competitor, and that few on the tour relished playing such a hard hitter. 'Big John' (always a slight misnomer as the six-footer was slimmer than photos suggested - kind of the opposite of my first impression of Ramy Ashour) was living in Nottingham after moving from his native Queensland, Australia via a spell in The Hague, and would always be a contender in the latter stages of the UK events that I attended. White was tough in a never-say-die kind of way, and was easier for the British crowd crowd to warm to than, say, Anthony Ricketts. When on the receiving end of poor decisions he rarely remonstrated with the officials, and this brought the respect of players and spectators alike. Rallies were never lost causes to White. Some say that being tall is not really an advantage in squash, but John exploited his reach to keep in the fight - even if it meant risking injury (see below, left!). Probably the best match that I saw him play was against Thierry Lincou in the semi-final of the Canary Wharf Classic in 2007. John's physical commitment pitted against the Frenchman's guile that day was a great display of contrasting styles, and made for a memorable evening's squash - and a great advert for the game. The Canary Wharf event attracts many who would not normally come and watch professional squash, and they could not have picked a better evening to attend. As I reported at the time (also see video below, left), one particular rally that White eventually won brought the crowd to their feet for the longest standing ovation that I've seen. White's 1998 conversion to Scottish representation (his father was born in Edinburgh) meant that I saw him competing a number of times in the British Nationals (a title he won in 2004), and he would also represented Scotland in the European Championships, the World Cup and the World Team Championships. 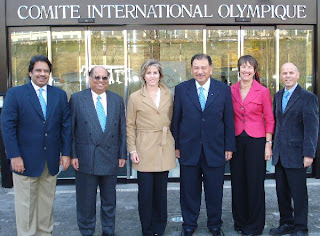 In March 2005 White moved again, this time to the USA, where he and his family established a new base in Philadelphia. His successes in US tournaments brought him back into the top 10, and his frequent trips back to the UK to compete in events brought warm appreciation from spectators. In 2007, White was appointed Director of Squash and head squash coach at Franklin & Marshall College in Lancaster, Pennsylvania. Aside from his inspiring commitment on court, what also endeared John to spectators was his sense of humour. I remember a double exhibition during the Super Series at Broadgate a few years back, where he pretended to ignore the other three players and go for a lie down beneath the tin. This - and the other practical jokes, asides etc. - were loved by the crowd. You got the feeling that White - although a model professional - equally recognised that the paying punter came to be entertained. His biggest achievements? A look back at the records shows that his greatest successes on the tour came relatively late in his career. White went full-time in 1991, but not until April 1998 did he break into the top twenty. He was runner-up at both the World Open and the British Open in 2002 (aged 29). 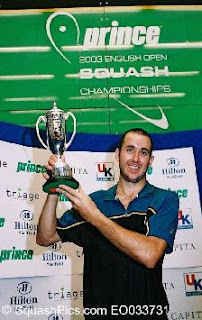 He then took the PSA Masters title in 2003 (beating Thierry Lincou in the final 15-8, 17-15, 17-16), and then there was the British Nationals in 2004 (beating Lee Beachill in the final). His performances at Canary Wharf (where he also reached the final in 2007), will also stick long in the memory (he reached 30 tour finals in total). Plus that 'big hitter' label will still remain - 172 miles per hour, which remains a world record. In the video interview at the top of this page Andy Nikeas sums up White's contribution to squash: "a finer ambassador you could not wish for".